If ever there was a rich context for a deep appreciation of one of America’s most original and brilliant thinkers, this is it. 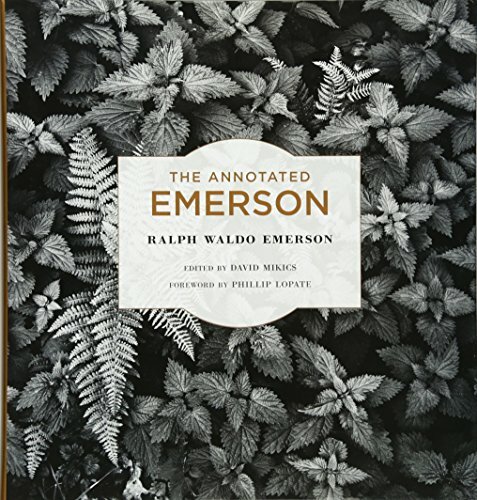 “This edition is designed for both the neophyte reader of Emerson and the experienced scholar” declares the introduction, and on its large cream, 9.5-inch by 9.5-inch pages we have a dedication to the original writing of Emerson and a detailed context of background images and carefully crafted notes that make the book (pardon the parallel here, Waldo) an elaborate hypertext of information at our fingertips. Ralph Waldo Emerson requires our full and dedicated application to his and our own thought. Though a champion of American aphorism, a writer of unforgettable gem sentences, he blended his public oratory with a sustained, contemplative investigation of thought, feeling, and the senses. Like good meditation, one follows a thought while simultaneously watching it within the mind and heart. Having said this, this reader admits the challenge of Emersonian thought and cautions any reader who seeks to devour Emerson to take frequent pauses for digestion. Perhaps the beautiful graphics provide opportunity for this rest. In rich color or deep sepia, illustrations such as the map of East Boston, the early photographs of the Emerson family and friends, the posters against the slave trade, even the full color reproduction of J. M. W. Turner’s “Slave Ship” painting, all inform and deepen the reading. The illustrations and notes also capture the tensions between the author’s life and his work. Mr. Lopate closes with his praise for Emerson’s rebellious nature and his relevance: “My own fondness for him rests on his intelligence and his truthfulness, his questing, nondogmatic sanity. He wrote some of the best reflective prose we have; he was a hero of intellectual labor, a loyal friend, and taking into account all his flaws and prejudices, a good egg who always tried to do the right thing. . . . Yes, we can even revere him, as a model of how to overcome anxiety and despair, and eloquently wed uncertainty to equanimity.” This seems an adequate formula for our times as well. Following a brief chronology of Emerson’s life, editor David Mikics takes over and provides a relaxed yet deeply informed “Introduction.” In 21 pages he captures the waves of events, alliances, influences, and progressive thought in the author’s long life (1803–1882). Immediately he renders Emerson’s American spirit, “Equal parts exaltation and grit, Emerson’s way of speaking is familiar to all Americans, whether they have ever read him or not. One recognizes how this pointed style has affected the book’s editor as he acts repeatedly as our personal guide and interpreter. His notes, placed neatly alongside of the main texts are “juicy” and eminently readable. When is the last time you enjoyed reading footnotes? Against the greed of his and our age, “Emerson outlined an ideal: ‘I wish to see America not like the old powers of the earth, grasping, elusive and narrow, but a benefactor such as no country ever was;” open to all, a welcome source of life and knowledge.” Mr. Mikics hands us this essential key to understanding this neglected genius through a recognition of how Emerson wed speculation and experience through an inclusive “reason,” one that embraces the material and the spiritual world. “Experience is the best teacher,” might be the dictum of both Emerson and this fine annotated text. Though the introduction at times moves quickly over periods of his life, such as his complex relationship with Henry David Thoreau or with the commune movement of the times, it opens the reader for what is to come, which is the choicest essays from Emerson’s long writing career: “Nature,” “The American Scholar,” the notorious “The Divinity School Address” that got Emerson banned from Harvard for decades. Among his literary writings taken from Representative Men are tributes to Montaigne and Shakespeare.” Included are his appreciation of contemporaries Margaret Fuller and Henry David Thoreau along with his sympathetic portrait of “John Brown” and some explanation of his abolitionist stand. This is all supplemented by a selection of his best and well-mannered poetry from Poems (1845) as well as his translations of Hafiz. Emerson is revealed as one of the first in America to embrace Eastern thought. What emerges from this authoritative yet accessible collection is a portrait of one of America’s most original and intuitive thinkers, a man for all seasons, along with the fruits of his writing. We owe editor David Mikics and the Belknap Press of Harvard University Press a debt of thanks for this fine assemblage. Larry Smith is the author of Lake Winds: Poems (2014), Kenneth Patchen: Rebel Poet in America (A Consortium of Small Presses, 2000), and Lawrence Ferlinghetti: Poet-at-Large (Southern Illinois University Press, 1982). He is also the publisher at Bottom Dog Press.